GOING DOOR TO DOOR IN HIS NEIGHBORHOOD AND PERFORMING FROM ATOP HIS DAD'S SUITCASE AT THE AGE OF FOUR SEEMED PERFECTLY NORMAL TO WADE TOWER. IT ALL CAME SO EASY TO HIM; MAKING PEOPLE LAUGH AND IMPRESSING THEM WITH HIS VOICE. FROM THESE FIRST CHILDHOOD PERFORMANCES TO HEADLINING AT NATIONAL CORPORATE EVENTS, WADE'S FOCUS HAS ALWAYS BEEN CLEAR: ENTERTAIN PEOPLE WITH SONGS AND STORIES ABOUT LIFE, LAUGHTER AND LOVE. FROM THE LIGHT-HEARTED JOKES, TO THE SONGS HE SINGS, WADE HAS THE AUDIENCE IN THE PALM OF HIS HAND. GIFTED WITH A SILKY-SMOOTH VOICE, WADE'S REPERTOIRE RANGES FROM SINATRA TO STRAIT, BUBLÉ TO BROOKS AND DUNN; MODERN HITS TO CLASSIC HYMNS. HE LIKES TO LOOK AT EVERY EVENT AS THOUGH HE IS THE HOST OF ONE BIG DINNER PARTY, AND HIS GOAL IS TO MAKE SURE EVERYONE HAS A GOOD TIME … AFTER ALL, IF THERE'S NO DESSERT (OR GREAT ENTERTAINMENT), IT'S JUST ANOTHER MEETING! PEOPLE ASK WADE ALL OF THE TIME IF HE FEELS LIKE HE WAS BORN IN THE WRONG ERA, SINCE HIS SHOWS ARE BASED ON THE STANDARDS HE LOVES SO MUCH, BUT HE SAYS ABSOLUTELY NOT. WADE FEELS LIKE THE WORLD NEEDS WHAT HE LIKES TO CALL "HAPPY MUSIC" MORE THAN EVER. THEY ARE THE SONGS THAT EVERYONE RECOGNIZES AND CAN'T HELP BUT TAP A TOE OR SWAY THEIR SHOULDERS TO. WADE HOPES TO USE HIS MUSIC AND PLATFORM TO KEEP ALIVE THE SEEMINGLY LOST PRACTICE OF MANNERS, DRESSING WELL AND REMIND THE WORLD THAT MEN SHOULD ALWAYS ACT LIKE GENTLEMEN. WADE HAS PERFORMED NATIONWIDE FOR CORPORATE AUDIENCES, CHURCH EVENTS, FUNDRAISERS, CONCERTS AND CELEBRATIONS FROM 10 TO 10,000. WHATEVER VENUE IT MAY BE, HIS GENUINE LOVE OF PEOPLE SHINES THROUGH WITH EACH PERFORMANCE. 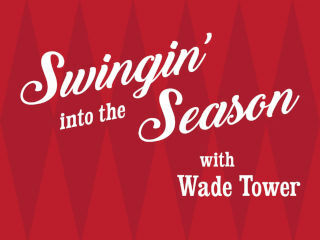 WADE HAS THE ABILITY TO CONNECT WITH EACH AUDIENCE THROUGH GREAT MUSIC AND HUMOR.